Suzanne Bartlett Hackenmiller, M.D. is a certified forest therapy guide (Cohort 10) and is the medical director of ANFT. 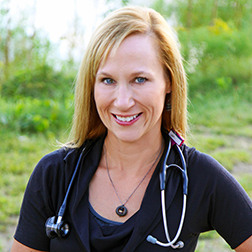 She is also an OB-Gyn and Integrative Medicine physician who currently lives and practices in Iowa. She completed OB-Gyn residency at Western Pennsylvania-Temple University in Pittsburgh and is a fellowship graduate of the University of Arizona Center for Integrative Medicine. She is board certified by both the American Board of Obstetrics and Gynecology and the American Board of Integrative Medicine and holds a 500-hour certification in herbal medicine. Dr. Bartlett Hackenmiller’s interest in integrative medicine and nature therapy arose from her personal journey through raising a child on the autism spectrum, her late husband’s death from cancer, dealing with physician burnout, experiencing the inadequacies of conventional medicine, and discovering personal wellness and solace through both outdoor adventure and mindfulness in nature. She and her current husband, Joe, share a passion for leading workshops combining outdoor adventure and the practice of forest bathing for women’s empowerment, individuals with special needs, cancer survivors, veterans and others. She is the author of an award-winning children’s book called “A Friend Like John, Understanding Autism,” and speaks nationally and internationally on the subject of autism, integrative medicine and nature therapy. Her book, “The Outdoor Adventurer’s Guide to Forest Bathing,” is slated for release by Falcon Guides in the summer of 2019. More information is available at her website, www.IntegrativeInitiative.com.